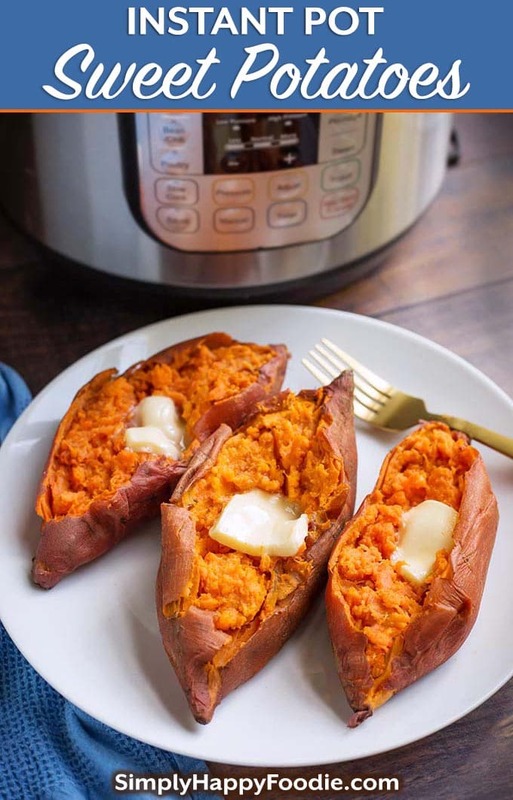 Instant Pot Sweet Potatoes are delicious and healthy, and turn out so creamy and fluffy! 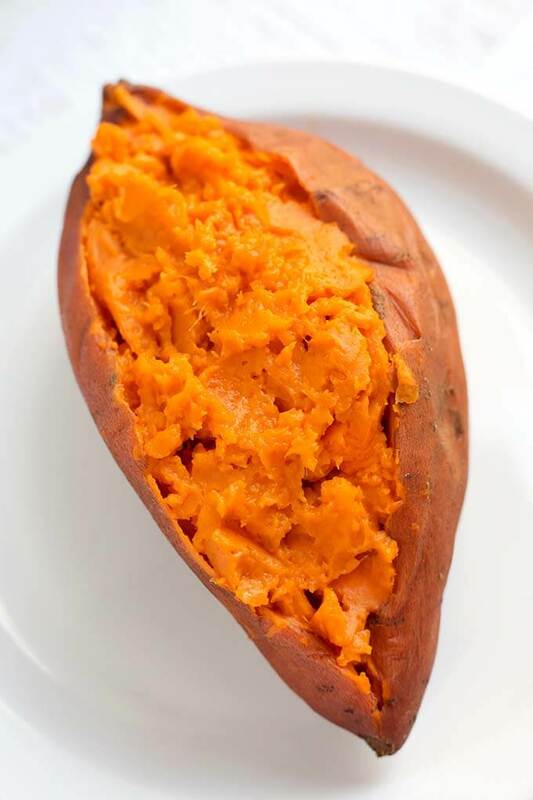 Best of all, pressure cooker sweet potatoes are so easy to make! Pile on your favorite toppings and you have a delicious vegetable side dish, or main course. 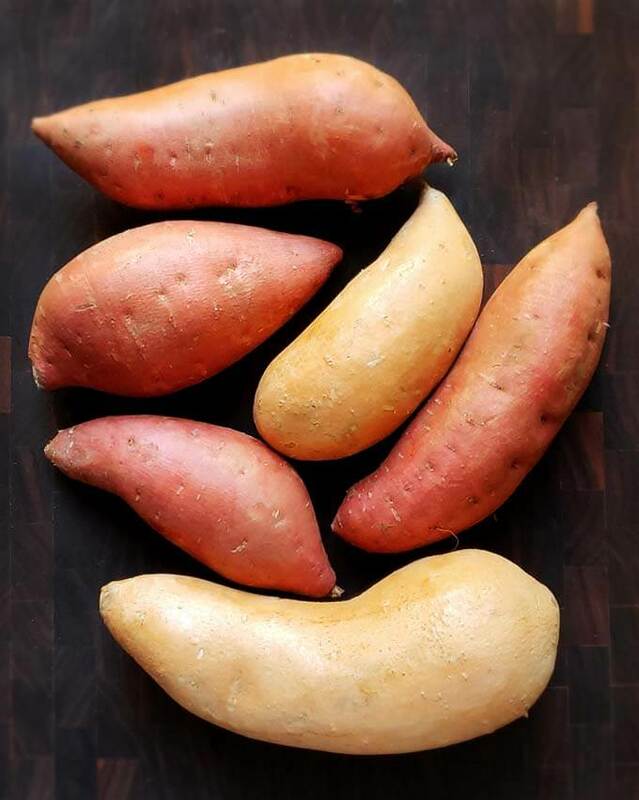 No matter what you call them, Instant Pot Sweet Potato or Instant Pot Yams, they are delicious! I love sweet potatoes! I used to bake them in the oven, or microwave them. Then I started cooking them in the Instant Pot® and boy did that make a difference! I was really impressed with how creamy and delicious they were! The skins come right off, and the ends don’t dry out or shrivel up. What’s the difference between sweet potatoes and yams? Yes, Sweet Potatoes are different from Yams. Here is a great article explaining this at the Library of Congress website. These are all sweet potatoes. Different varieties can have different colors, and they vary in size, too. I had to do a bit of testing to find the cook times that work the best for Instant Pot Sweet Potatoes. Pressure cooking cook time is all about how thick and/or dense the food is, so there is no “one size fits all” for them. Thicker sweet potatoes will take longer to cook than thinner ones. Altitude, as well as different PSI’s of pressure cookers will also have an affect on the cook time. 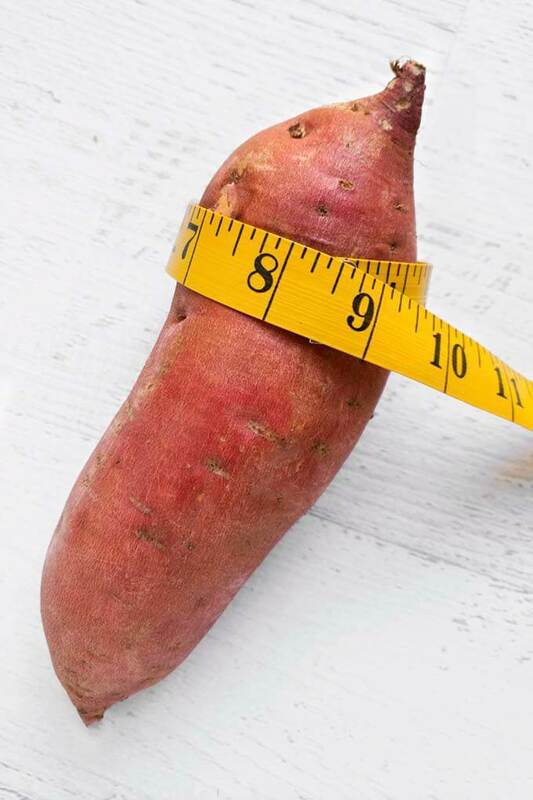 To find the best cook time for your sweet potatoes, just measure them first (at the widest part) to find out the circumference. Sweet potatoes vary in size pretty drastically, and knowing the circumference helps determine how long you should cook them for. I cooked this 8.5″ sweet potato for 25 minutes on high pressure, with a 10 minute natural release. It came out soft and perfect! I shared it with Gizmo! This is a 9.5 inch sweet potato. I cooked it for 30 minutes on high pressure, and a 10 minute natural release. Perfect! When you are shopping for your sweet potatoes, it would be good to buy similar sized potatoes of the same relative thickness. That way, if you need to cook more than one, they will all be done in the same amount of time. Of course, if you are only going to cook one Instant Pot Sweet Potato at a time, just get the size you need! Once you make Instant Pot Sweet Potatoes a few times, you won’t need to refer to a time chart as you will get the hang of it. If you do forget, just come back here and visit this page! 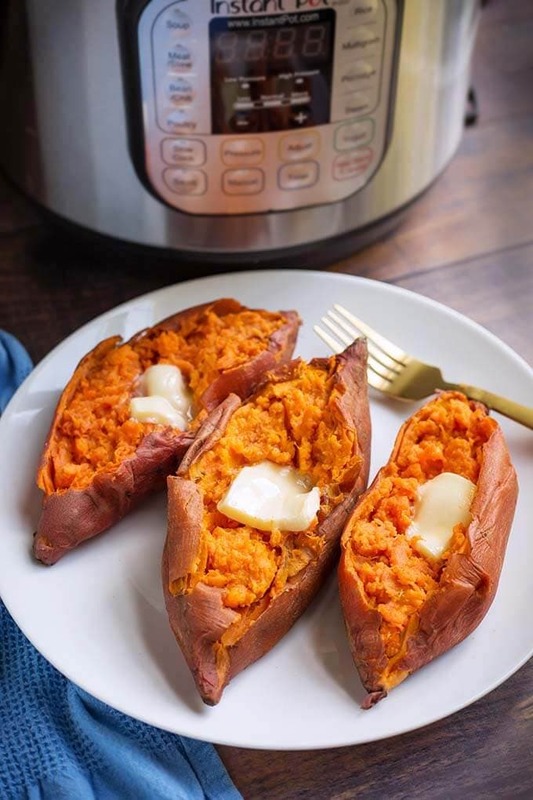 Instant Pot Sweet Potatoes are delicious and healthy. 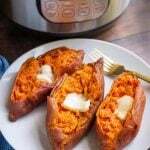 Best of all, these pressure cooker sweet potatoes are so easy to make! Pile on your favorite toppings and you have a delicious vegetable side dish, or a main course! Put the water into the inner liner of the pressure cooker. Set the trivet/rack/steamer basket into the pot also. Scrub the sweet potatoes with a vegetable brush. Measure the circumference of the sweet potatoes at the widest part. If you have several sweet potatoes, add up the total measurements and divide by the number of sweet potatoes you have. That number is the average circumference of the sweet potatoes, and will be the number you will use to cook them (Try to use the same size potatoes if you can for more even cooking). Put the sweet potatoes in the pot, on the rack and close the lid. Set the steam release knob to the Sealing position. Press the Pressure Cook or Manual button or dial, and then the +/- button or dial to select the cook time in minutes. If your sweet potato is larger than 11", consider cutting it in half lengthwise and cooking for the new circumference of the halves. These times are what I've tested in my 6qt IP DUO, and they work for me every time. Your results may vary, but you can always pop them back in for a few minutes to get them softer if they don't get cooked enough for you. When the cook time is finished, let the pot sit undisturbed for 10 minutes (10 minute Natural Release). Then turn the steam release knob to the Venting position to manually release any remaining steam/pressure. When the pin in the lid drops down, open the pot and use a small knife to check for doneness. Pierce the widest part of the potato, and if the knife slides in very easily, they are done. If they are not soft enough for you, close the lid and set for a few more minutes. Use tongs to remove the cooked sweet potatoes. Then slice the skin and add butter, or any condiment you like. My favorite is butter, a pinch of salt, a drizzle of pure maple syrup, and some chopped pecans. YUM! Calories based on 1 cup of cubed sweet potato. Sweet potatoes turned out awesome! Thanks for sharing!